Persistence Market Research offers an 8-year forecast for the life insurance policy administration system market between 2018 and 2026. In terms of value, the life insurance policy administration system market is expected to register a CAGR of 12.0% during the forecast period. The study demonstrates the market dynamics and trends globally across various regions, which include North America, Latin America, Europe, China, Japan, South East Asia and the Middle East & Africa, which influence the current nature and future status of the life insurance policy administration system market over the forecast period. This research report provides a detailed analysis of the life insurance policy administration system market and offers insights on the various factors. The market study also provides a comprehensive assessment of the stakeholder strategies and imperatives for succeeding in the business. The report segregates the life insurance policy administration system market based on component, deployment type, policy administration category, end-user and module across different regions globally. Key players are introducing technologically advanced life insurance policy administration system tools for the maintenance and administration of policies. Regions such as Europe are witnessing a rapid change in their economy as well as a rural to urban shift. Developing countries such as SEA and Japan are witnessing rapid urbanization and growth in disposable income. These changes are creating significant demand for the deployment of life insurance policy administration systems in numerous industry sectors such as insurance companies, banks and others, which is, in turn, expected to lead to an increase in the adoption of life insurance policy administration systems due to increasing applications and multiple benefits. The report starts with an overview of the global life insurance policy administration system market in terms of value. In addition, this section includes an analysis of thy key trends, drivers and restraints, which are influencing the life insurance policy administration system market. The impact analysis of key growth drivers and restraints are included in this report to facilitate clients with crystal-clear decision-making insights. The global life insurance policy administration system market is categorized based on the component, deployment type, policy administration category, end-user, module, and region. On the basis of deployment type, the life insurance policy administration system market is segmented into SaaS and on-premise. On the basis of component, the life insurance policy administration system market is segmented as software and services. The services segment is further segmented into managed services and professional services. On the basis of policy administration, the market is segmented into policy lifecycle, underwriting, contract changes, claim settlement, user experience and others. On the basis of end-user, the global life insurance policy administration system market is segmented into insurance companies, banks and others. On the basis of module, the global life insurance policy administration system market is segmented into customer relationship management, product development, training & development, business intelligence and others. A detailed analysis has been provided for every segment in terms of market size analysis for the life insurance policy administration system market across the different regions. The next section consists of a detailed analysis of the life insurance policy administration system across various countries in the region. It provides a market outlook for 2018–2026 and sets the forecast within the context of the life insurance policy administration system including latest technological developments as well as service offerings in the market. This study discusses the key trends within countries contributing to growth of the life insurance policy administration system market, as well as analyses the degree at which drivers are influencing the life insurance policy administration system market in each region. The key regions and countries assessed in this report include North America (U.S. & Canada), Latin America (Brazil, Mexico, & the rest of Latin America), Europe (Germany, UK, France, Italy, Spain, BENELUX, Russia, & the rest of Europe), China, Japan, SEA & others of APAC (India, Australia & New Zealand, ASEAN, and Rest of SEA & other APAC), MEA (North Africa, South Africa, GCC, Turkey, & the rest of MEA). This life insurance policy administration system report evaluates the present scenario and the growth prospects of the life insurance policy administration system market across various regions globally for the period 2018 –2026. We have considered 2017 as the base year and provided data for the remaining 12 months. The forecast presented here assesses the total revenue by value across the life insurance policy administration system market. To offer an accurate forecast, we started by sizing the current market, which forms the basis of how the life insurance policy administration system market will develop in the future. Given the characteristics of the life insurance policy administration system market, we have triangulated the outcome of different enterprise types and end-user analyses based on the technology trends. In addition, it is imperative to note that, in an ever-fluctuating global economy, we not only conduct forecasts in terms of CAGR, but also analyse on the basis of key parameters such as year-on-year (Y-o-Y) growth to understand the predictability of the life insurance policy administration system market and to identify the right opportunities across the market. In the final section of the report, we have included a competitive landscape to provide clients a dashboard view based on the categories of providers in the value chain, their presence in the life insurance policy administration system portfolio, and key differentiators. This section is primarily designed to provide clients an objective and detailed comparative assessment of key providers specific to a market segment in the life insurance policy administration system value chain and the potential players for the same. Report audiences can gain segment-specific vendor insights to identify and evaluate the key competitors based on an in-depth assessment of their capabilities and success in the marketplace. Detailed profiles of providers are also included in the scope of the report to evaluate their long-term and short-term strategies, key offerings, and recent developments in the life insurance policy administration system market. Some of the key competitors in the life insurance policy administration system market are Oracle Corporation, Accenture Plc, InsPro Technologies LLC, Concentrix Corporation, DXC Technology Company, Infosys Limited, SAP SE, Capgemini SE, Mphasis Wyde, EXL Service Holdings, Inc., Sapiens International Corporation and Majesco. A life insurance policy administration system provides the end-to-end lifecycle management of group life, individual as well as pension products. It helps organizations can maintain a record of the policies issued by them, calculate policy costs, as well as design new policies. Thus, it is a software that helps insurers manage life and annuity insurance policies. A life insurance policy administration system has the ability to improve the flexibility and administration of different insurance policies. Moreover, a life insurance policy administration system can be implemented either as a part of an integrated insurance suite or as a standalone solution. 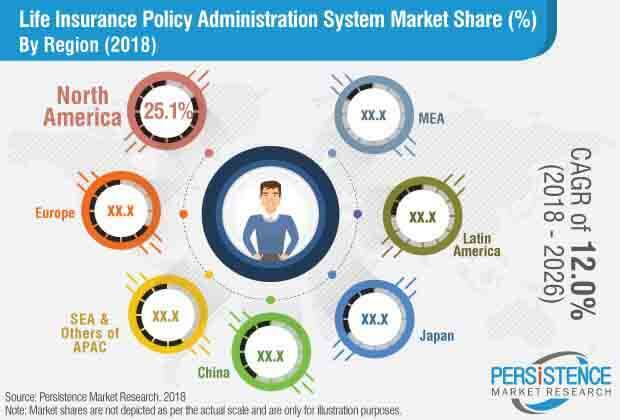 Increase in the outsourcing of policy administration functions, rapidly changing market conditions, and the need to remain up-to-date with the technology are some of the major factors fueling the growth of the life insurance policy administration system market. However, rapid upgradations of products and increasing competition are identified to be among the major factors restraining the growth of the life insurance policy administration system market at a global level, especially in some of the developing economies. On the basis of deployment type, the life insurance policy administration system market is segmented into SaaS and on-premise. The revenue contribution from the SaaS segment is expected to expand at a CAGR of 13.0% during the forecast period. On the basis of component, the life insurance policy administration system market is segmented as software and services. The services segment is further bifurcated into managed services and professional services. The services segment is expected to have a market share of 35.9% in 2018 to 39.1% in 2026. On the basis of policy administration, the life insurance policy administration system market is segmented into policy lifecycle, underwriting, contract changes, claim settlement, user experience, and others. The revenue contribution from the user experience segment is expected to expand at a CAGR of 13.7% during the forecast period. On the basis of end-user, the global life insurance policy administration system market is segmented into insurance companies, banks, and others. The insurance companies segment in life insurance policy administration system is expected expand at a CAGR of 12.5% during the forecast period. On the basis of module, the global life insurance policy administration system market is segmented into customer relationship management, product development, training & development, business intelligence, and others. The business intelligence segment is expected to grow from US$ 560.9 Mn in 2018 to US$ 1,579.7 Mn in 2026 owing to high CAGR associated with it. Among the key regional markets, the Europe life insurance policy administration system market is projected to exhibit relatively higher growth in the global market and register a CAGR of over 15.5% during the forecast period. Revenue from the life insurance policy administration system market in Europe and North America is expected to collectively account for over 46.7% of the global life insurance policy administration system market revenue in 2018. Key competitors in the life insurance policy administration system market are DXC Technology Company, Oracle Corporation, Capgemini SE, Accenture Plc, Concentrix Corporation, Infosys Limited, Mphasis Wyde, SAP SE, InsPro Technologies LLC, EXL Service Holdings, Inc., Majesco, and Sapiens International Corporation.